This delightfully illustrated chapter book geared for 8-to-12 year olds, tells the charming tale of five family members and their naughty dog (each with a different sensory processing challenge), and how they get in sync after a tough day. 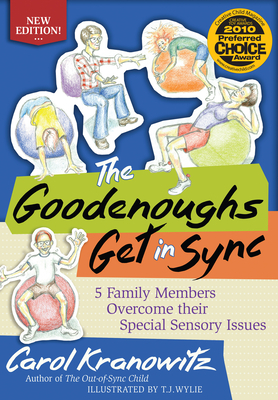 The Goodenoughs Get in Sync, first edition was the winner of an i-Parenting Media Award and was a Finalist for ForeWord Magazine's 2005 Book of the Year for juvenile non-fiction. This new edition has a new preface and revised introductory chapter to help people understand SPD even more clearly. Carol Kronowitz is the Editor-in-Chief of S.I. Focus, the international magazine on sensory integration and sensory processing. A preschool teacher for 25 years, Kranowitz observed many young children with Sensory Processing Disorder. In writings and workshops she leads in the United States and abroad, she explains to parents, educators, and other early childhood professionals how sensory issues play out - and provides fun and functional techniques for addressing them at home and school. She has written several manuals and books on SPD, including The Out of Sync Child (2005) and The Out of Sync Child Has Fun (2006). A graduate of Barnard College, Carol has an M.A. in Education and Human Development from The George Washington University. She lives in Bethesda, Maryland.